Chocolate Chip Cookie - A new twist on an old favorite. 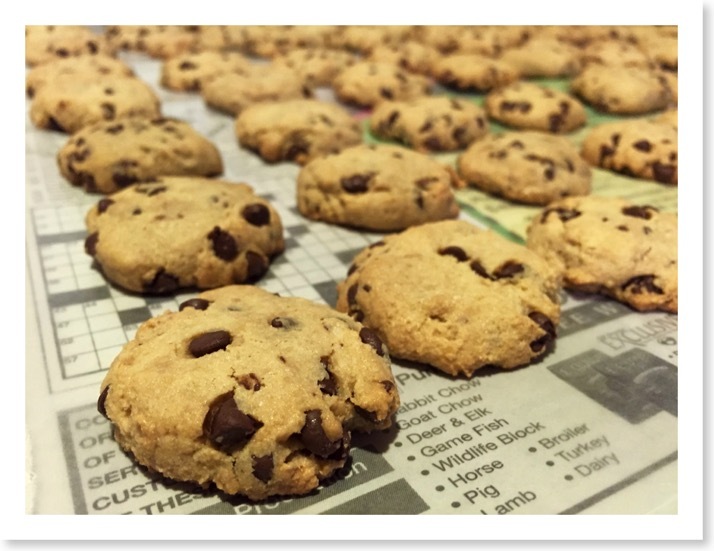 This was Peggy's entry for the 2015 Cookie Daze Bake & Taste Contest. She tweaked Laurie's Grain-Free Chocolate Chip Cookie recipe slightly; replacing some of the almond flour with coconut flour. This helped combat the humid weather we have this time of year. Mix together the dry ingredients: flours, baking soda & salt. Mix together the wet ingredients: sugar, vanilla, egg, melted butter. Combine dry and wet ingredients, then add chocolate chips. Place tablespoon sized dough balls on a cookie sheet. After removing from the oven, allow cookies to cool slightly before removing from pan.